**Prices are indicative and depend on EURO/DOLLAR exchange rates Shipping costs included; US and Canadian tax rates excluded. ***Prices are indicative. Shipping costs excluded, Dutch BTW included. Please see the order guide for information on costs of delivery. > Please note that persons holding a Canadian First Nations status card and who live and work on their reserve are generally tax exempt. More ring models will follow soon. Please contact us for prices of a sterling silver eagle feather ring mounted with a moissanite, a sapphire, a ruby, a topaz, an amethist, a turquoise, or a Swarovski zirconia. Marquise-, brilliant-, and Princess-cut gems in different qualities and sizes are a possibility. This elegant sterling silver ladies’ ring is titled ziigwan miinigoziwin, which means “Gift of Spring.” The design of the ring tells a story of the physical and spiritual bond between two lovers that originates in the east, the direction of springtime, and the spring of life. Waaban, the east, is where we come from. Waaban represents the springtime, and the spring (source) of life. Spring is the time when new life begins and flowers begin to grow. Waabang (in the East) is where we begin our journey as anishinaabeg (human beings) coming from the spirit world into the physical world. Our journey begins in the East when Gichi-manidoo (the Great Spirit) breathes the spirit of life into us. And the Great Spirit, this sum of mystery, is the one that motivates and inspires all living things in this great circle called life. We as human beings are spirits on a physical journey, until our last breath. Life is a gift. To honor that gift the spirits that dwell in the East gifted our ancestors with the gift of asemaa (tobacco). This gift of asemaa is still being honored today and reminds us to be grateful for all life. It reminds us daily to be grateful and to be humble knowing that we as humans - and as married couples - will always require guidance and protection, and cannot exist without the gifts of the natural world around us – being the wind, the earth, the fire, the water, and all of those relatives and entities, natural as well as supernatural, that are alive with energy and movement. The stylized eagle feather adorning the ring epitomizes the omnipresence of the sky and the light of the eastern direction and, in a metaphorical sense, the spiritual quality surrounding us in life. 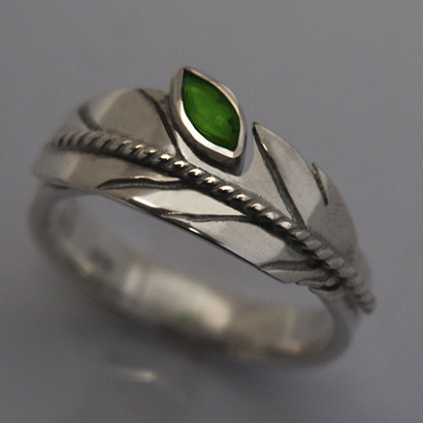 The 0.236" x 0.118" marquise-cut emerald placed inside the eagle feather represents aki (mother earth) and the miinikaanan (seeds) in her bosom; the precious stone stands, in color and form, for birth and youth, and for the fertile earth in springtime, when the seeds sprout forth from the earth and life returns to the land. It stands for the first sound of creation, and the time of morning that starts in the East. Last but not least, the color and brilliance of the emerald stone express the hope that the wearer of the ring will walk a future road of healthiness and happiness. All these spiritual entities, sky and earth, birth and rebirth, and the many gifts that the East and springtime bring us, come together in the ring design and represent the deep and organic love that two people feel for each other.